Today (September 14th 2012), Facebook Launches their “Subscribe” button. So what does that mean!? On the site, you’re going to start to notice that some users have the button at the top of their profile that says “Subscribe”. If you click it you’ll start seeing that persons/brands updates in your News Feed, just as if you were their Facebook friend. SO WHAT’S THE DIFFERENCE? Unlike normal Facebook friends, when you subscribe to someone, they do not approve your request so their is no limit on how many people can subscribe to anyone. It’s a “Twitter-esk” and Google + like update. Today (Aug 22nd, 2011), Mashable announces that Facebook will be making massive Privacy and photo tagging changes. It’s one of the largest privacy overhauls in the companies history! It’s going to help users make it much clearer about who you are sharing pictures, status updates and locations with. 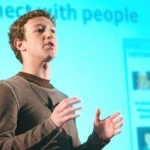 Facebook made a big announcement yesterday (July 6, 2011), and lots of people are still wondering what it’s all about. So Fresh ID is going to break it down for you! After watching the press conference and browsing the internet for more clues, and reading what others have said, I think I can sufficiently break it down for us “average joes” in the technology world. So, what was the conference all about? First off, be prepared because Zucky said that this is just the start of “Launching Season 2011″. Secondly, Mark Zuckerberg did a great job of talking about WHY and WHERE Facebook is going, giving some insight on how social networks are being used today, how they will be used in the future, and how Facebook plans on keeping up. Zuckerberg talked about the social networking trend being at an “inflection point” and that for the past 5 or so years, we’ve all talked about how social networks are used to “connect people”. He sees the next 5 years of social network activity to not just be about connections, but be about the value we receive from it. He talked about measurement, and how in the past we’ve been measuring success on these sites based on “number of users”, but Facebook wants to measure it based on the value of what people are using and getting out of the network. This is an interesting concept to me, and I definetly agree with him on this point that in the future, we are not going to be measuring number of users online, but measuring VALUE, what we are getting from online networks, searches etc. The internet holds such a vast capability to enhance our communication, knowledge and relationship skills as human beings, so I’m thrilled to know that Facebook is really working with this model and staying on top of the social evolution that has become the internet and Facebook. Zuckerberg announced that there are now over 750 million users on Facebook and everyday they share around 400 billion content (this is publically shared, not counting privatley shared goodies). This number is huge, given the fact that they announced a few months ago that they hit 500 million users! It truly is taking over the world and how people connect. Have you ever been out (say a bar) and had someone say to you “Facebook me”? It’s becoming as common, or even more common than “Call me”. We now know that people are sharing TWICE as much information today than they were the same time last year, and the Facebook team only sees it growing in the future. Ok, so what exactly was the “Big announcement”? Well there were actually three. Let me break it down. Group Chat: This product was rolled out less than a year ago and already over 50% of users utilize this function, with an average of 7 people per group. It’s a way to organize a group of people and gives the ability to see the history of what everyone has said (which can sometimes be annoying if you get stuck on a chat you don’t want to be on, trust me I know), but in the grand scheme of things its an efficient way to communicate with larger groups of your “Friends” . So, what’s new? 2. New Chat Design: Everyday, a billion messages take place on Facebook, so redesigning it to fit more browsers is smart. It’s one of the largest chat networks online today! So what’s going to be new about this design? Ability to send messages by clicking your friends account, as seen on the right hand side bar. I see this as just the evolution of Facebook chat and a smart, simple re-design that was necessary and won’t neccesarily make things worse, but in the end provide an easier to use chatting experience no matter what kind of computer or browers you use. 3. Video Chat: This was the “big” announcement that has had the internet buzzing for awhile. 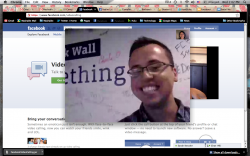 Yes, Facebook announced that they are partnering with Skype and creating Facebook Video Chat. I was a little skeptical about the new addition, but after watching it be demoed, it seems incredibly easy and something I am personally very excited for! See, you don’t need Skype to participate, you just need a Facebook account. You can talk to any of your friends (and only YOUR friends) by simply downloading and “allowing” the app. Facebook claims you can download in 20-30 seconds and chat away with whoever you’d like! This “one click connection” is really going along with Facebook’s theory about measuring the value of HOW people are using the internet and Facebook. The ability to talk to any of your friends directly from your Facebook page is very exciting, easy to use and absolutely the next “evolution” in this social networking ecosystem. Did y ou know you don’t HAVE to have video/microphone capabilities on your computer? Local social networking expert, Ramsey Mohsen, talked with KCTV5 News yesterday and explained that your friends/family don’t even need camera/mircorphone to use the Facebook Chat! I’m really excited and interested to see how this Facebook chat not only effects how we are connecting and communicating with each other, but how human beings will continue to use the internet and change it’s use over the next few years. The video chat, to me, is right on scale with where social networks should be going, and I look forward to see how businesses, celebrities and even educational institutions use this in the future! Here are a few links that I used to help me wrap my head around what all Facebook rolled out yesterday. Have fun checking out the new features! Let us know what you think, and until Facebook makes another change, we will talk next time! Thanks Fresh ID…made it easy for me to understand.